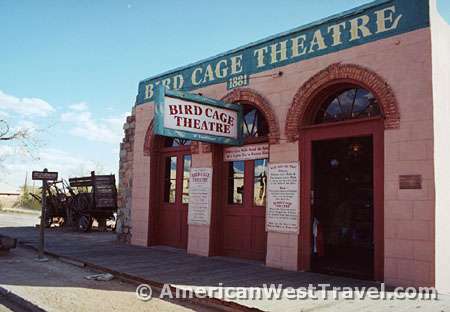 During Tombstone's boom years, from 1881 to 1889, the Bird Cage Theater was the town's favorite night spot. It offered gambling, liquor, risque entertainment, and women "of the night". It was rated the "wickedest" night club in America by the New York Times. 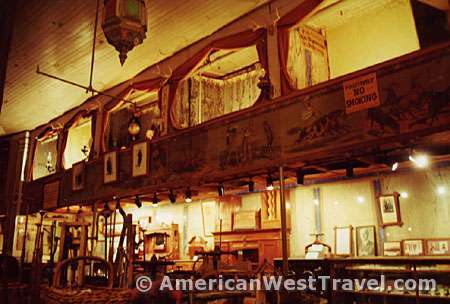 When boom turned to bust in 1889, the Bird Cage was sealed and boarded up with all its furnishings intact. It re-opened in 1934 as a unique historic landmark, the only spot in Tombstone preserved in its original state. 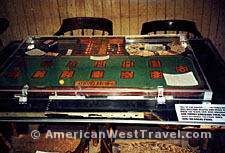 All the fixtures, furnishings, and gambling tables date from the days of the Earps. The business license issued in 1881 to "Dutch Annie" Smith by Cochise County to run a "House of Ill Fame" still hangs on the wall. 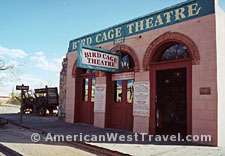 Today, the Bird Cage functions as a museum, not a honky-tonk. In addition to the theater's original contents, many other relics from old Tombstone are on display. 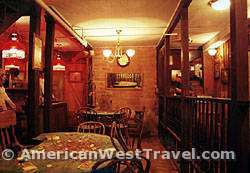 The photo, (right), is Doc Holliday's faro table. This was Doc's favorite game of chance, and he often served as the dealer. 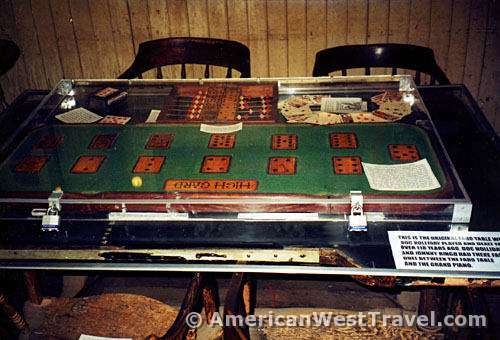 The note in the lower right of the photo says: "This is the original faro table where Doc Holliday played and dealt faro over 118 years ago. 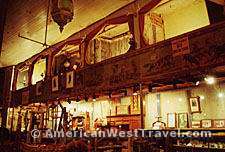 Doc Holliday and Johnny Ringo had their famous duel between the faro table and the grand piano." Apparently, no gunfight took place during this "duel". It was actually (allegedly) the drunken posturing of the town's two most feared gunmen. There were however 16 real gunfights within this building. The walls and ceiling are decorated with about 140 bullet holes. If you enlarge the photo, (left), a couple bullet holes are visible in the wall above the grand piano. 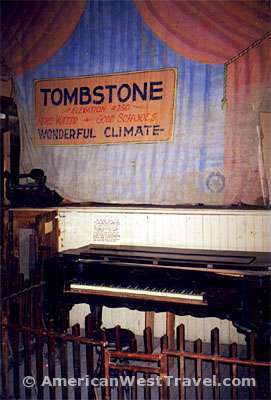 The piano was custom-built in Europe, shipped around South America to San Francisco, then delivered to Tombstone by rail. It has stood in this spot since 1881. The most valuable antique on display is the infamous Black Moriah (photo, right), the town hearse. 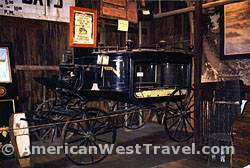 Apparently, it was decided that the departed ought to take their final ride to Boothill in style. The hearse is trimmed in 24k gold and sterling silver. The McLaury brothers rode the Black Moriah to Boothill together after the shootout. There wasn't enough room for Bill Clanton who had to settle for a lesser ride. 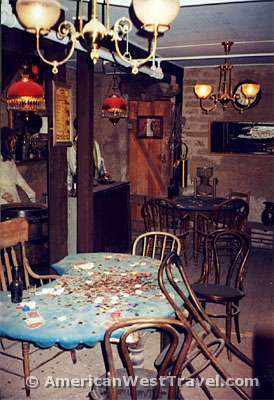 The table in the foreground hosted the longest poker game in western history. The game ran non-stop for 8 years, 5 months, and 3 days. (The theater was open 24 x 7.) Buy-in was $1,000 minimum. Many of the old west's most famous personalities participated at one time or another. A wooden floor has been added to the basement during the modern era. 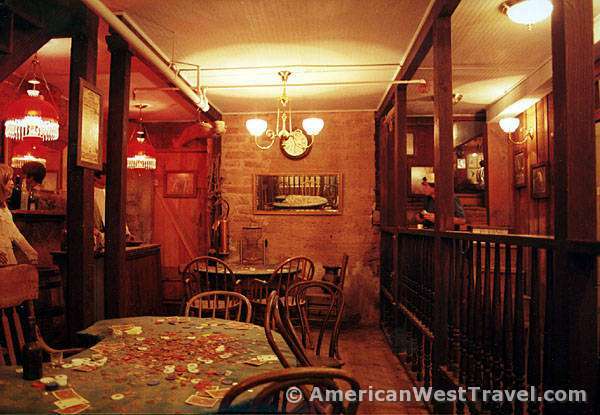 However note in the photo, (left), that the original dirt floor has been preserved beneath the poker table. The tipped chair is said to have been exactly in that position when the last game ended. The name, "Bird Cage", was derived from the 14 cages suspended from the ceiling in the main hall (right). The "ladies of the night" were put on display in these cages so the men could make their selections. 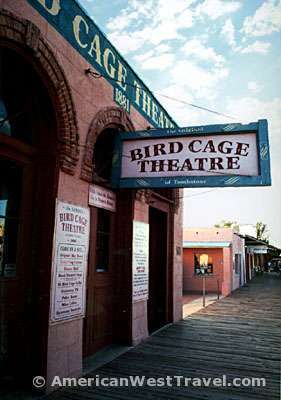 The popular song refrain from that era, "she's only a bird in a gilded cage", was actually about the ladies at the Bird Cage Theater. 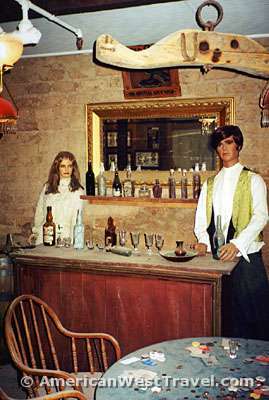 Today, the main hall houses display cases full of fascinating artifacts from Tombstone's early days. First published in 1927, Tombstone defined the legend of lawman-gunfighter Wyatt Earp. From Tucson, Arizona, proceed east on Interstate-10 roughly 50 miles to the town of Benson. Then south on US-80 for twenty miles.